The Seahawks extended a tender to Moore, an exclusive rights free agent, John Boyle of the team's official site reports. Analysis: Moore has built himself up from a 2017 seventh-round pick that spent most of his rookie year on the practice squad to a regular contributor on offense last season. While he had a 22-413-5 line on 36 targets in eight games between Weeks 4 and 12, he otherwise managed just four catches (on 17 targets) for 32 yards and no scores in the other eight contests. Clearly, the Seahawks will hope he can channel that productive mid-season stretch more consistently in 2019. Moore played 12 offensive snaps and didn't receive a target in Saturday's wild-card loss to the Cowboys. Moore snagged two of four targets for 16 yards in Sunday's win over the Cardinals. Analysis: Moore looked like a valuable player after hauling in five touchdowns in seven games between Week 5 and 12, but he has just four catches on 15 targets for a combined 32 yards in five contests since then. It's unclear where Moore's spark went, but the second-year pro could redeem himself with some stellar postseason play starting Saturday versus the Cowboys. Moore caught one of his three targets for a seven-yard gain during Sunday's 38-31 win over Kansas City. Moore hauled in one of three targets for nine yards in Sunday's loss to the 49ers. Analysis: Moore posted a career day in Week 12 against the Panthers with 103 receiving yards and a touchdown, but he now has just one catch on nine targets in the last three weeks. The second-year pro's recent play is troubling, although he is a deep threat so his fantasy value can be prone to volatility. He'll look to get back on track against the Chiefs' last-ranked pass defense in Week 16. Moore couldn't haul in any of his five targets in Monday's win over the Vikings. Analysis: Russell Wilson tried finding Moore deep multiple times but was unsuccessful, as Moore was held without a catch for the second straight week. It's troubling that the second-year pro couldn't get into the action with Doug Baldwin (hip) out. He'll look to right the ship Week 15 against the 49ers. Moore didn't receive a target in Sunday's win over the 49ers. 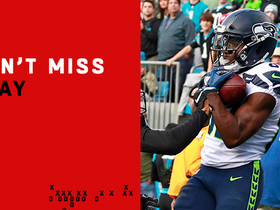 Analysis: Russell Wilson only attempted 17 passes and five were directed at running backs, but Moore was oddly missing from the stat sheet after posting a career game last week. Moore has plenty of talent and is a capable deep threat, so this trend shouldn't carry on. Look for him to get back into the fold Week 14 against the Vikings. 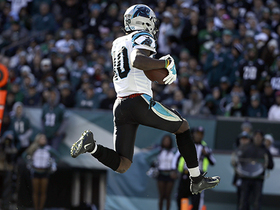 Moore caught four of five targets for 103 yards and a touchdown in Sunday's win over the Panthers. Analysis: Moore showcased big-play ability once again with two catches over 35 yards. One of those snags came as he hauled in a 35-yard touchdown pass over a Panthers' defender to tie the game 27-27 with 3:26 remaining in regulation. This is the first time Moore surpassed 100 receiving yards in his career, but he's yet to catch more than four passes in a game. Still, Moore has five touchdowns and can be considered a cheap, albeit valuable, daily fantasy option. Moore hauled in four of eight targets for 57 yards in Thursday's 27-24 win over the Packers. Analysis: A majority of Moore's production came on a disputable 27-yard catch down the left sideline that he eventually fumbled out of bounds. Regardless, his eight targets were a career-high and represented the second-most on the team Thursday. He hasn't found the end zone in three weeks and will look to reverse that trend in Week 12 against the Panthers, who have allowed 22 passing scores this year. Moore caught one of three targets for 16 yards in Sunday's 36-31 loss to the Rams. Analysis: Moore scored four times in three games between Weeks 5 and 8, which seemed too good to be true. Since then, he's recorded just three receptions for 32 yards and no touchdowns. That's not going to pay the bills. Fantasy owners should beware the touchdown-dependent wideout ahead of a Thursday night game versus the Packers, who allowed just three scores to wide receivers over the last three weeks. Moore caught two of seven targets for 16 yards and no touchdowns in Sunday's 25-17 loss to the Chargers. Analysis: Moore disappointed by failing to convert with a season-high seven targets coming his way, as he failed to find the paydirt for the first time since Week 4. Still, the usage solidifies Russell Wilson's faith in Moore. He'll face off against the Rams in Week 10, a team on which he scored twice earlier this season. Moore caught all four targets for 97 yards and a touchdown in Sunday's 28-14 win over the Lions. Analysis: Moore now has touchdowns in three straight games, recording four overall in that span. The second-year pro set career highs in receptions and yards during the game. He's shown an ability to stretch the field and Russell Wilson has noticed, allowing Moore to lead the team in targets in two of the last three outings. Moore caught two of three passes for 47 yards and a touchdown in Sunday's 27-3 win over the Raiders. He also rushed once for five yards. Analysis: Moore has elevated to the No. 3 wideout role, but his value still is dependent on touchdowns. The second-year pro scored twice in Week 5 against the Rams and kept the momentum rolling with another score in Week 6. He's still unreliable with just nine targets in the last three weeks. 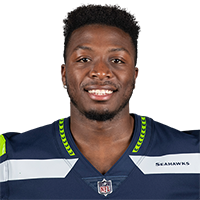 Moore caught three of four targets for 38 yards and two touchdowns in Sunday's 33-31 loss to the Rams, playing 31 of 60 snaps (52 percent) on offense, per Gregg Bell of The Tacoma News Tribune. Analysis: Moore operated as the clear No. 3 wide receiver ahead of both Jaron Brown (nine snaps) and Brandon Marshall (seven). It isn't a role with much potential for consistent production, but Moore at least did his best to ensure he'll stay involved with a few targets per game. Next up is a Week 6 road matchup with an Oakland defense that's allowing 8.9 yards per pass attempt. Moore caught both targets for 39 yards in Sunday's 20-17 win over the Cardinals. 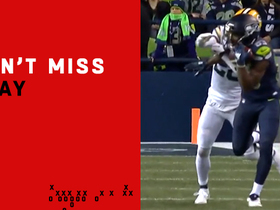 Analysis: Moore had only been targeted once before this game, and these were the first two receptions of his career. The second-year pro is still lined up as the No. 5 wideout and shouldn't be considered in fantasy settings at this time. Moore caught a 36-yard touchdown pass in Friday's preseason game against the Vikings. Moore caught two passes for 71 yards during Saturday's 24-14 preseason loss to the Chargers. 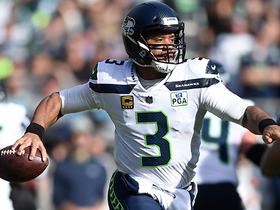 Analysis: QB Russell Wilson connected with Moore deep down the left sideline for 52 yards before throwing to him again on the next play for 19 yards to take the Seahawks to the one-yard line. 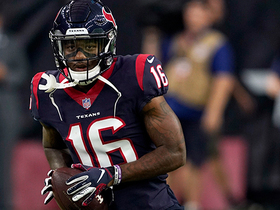 Moore is pacing the squad in receiving yards (106) through two preseason games and positioning himself well to snag one of the final wideout spots. Moore secured both of his targets for 35 yards in Thursday's 19-17 preseason loss to the Colts. 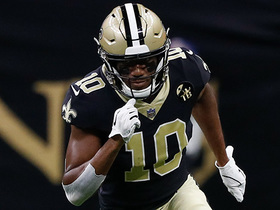 Analysis: The second-year pro is looking to make a statement this preseason in order to secure one of the final wideout spots. 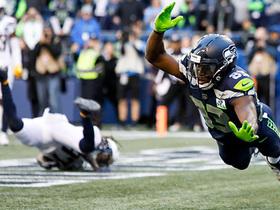 Moore (hip) has returned to the practice field, the Seahawks' official site reports. 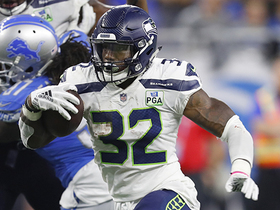 Analysis: Moore's hip flexor injury sidelined him early in training camp, but he appears to be fine ahead of the Seahawks' first preseason game. A good preseason showing could put Moore in position to fill out the bottom of the receiver depth chart, though special teams play may be vital to his chances. Moore has been sidelined during training camp due to a hip flexor, Curtis Crabtree of Sports Radio KJR reports. Analysis: Moore's absence has extended to a couple of days, but the nature of his hip injury doesn't sound too severe. The 2017 seventh-rounder appeared in just one game as a rookie with Seattle last season. 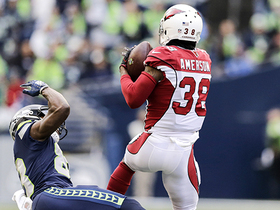 Arizona Cardinals cornerback David Amerson picks off Seattle Seahawks quarterback Russell Wilson on the Seahawks' opening possession. Seattle Seahawks quarterback Russell Wilson goes for it all on fourth down and connects with wide receiver David Moore for a 35-yard touchdown. Seattle Seahawks quarterback Russell Wilson goes deep to wide receiver David Moore for 54 yards. Seattle Seahawks wide receiver David Moore makes a one-handed catch deep downfield against the Green Bay Packers on "Thursday Night Football" in Week 11 of the 2018 season. 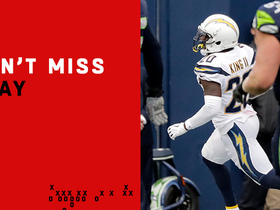 Los Angeles Chargers cornerback Desmond King picks off Seattle Seahawks quarterback Russell Wilson and returns it 42 yards for a touchdown. With no time left on the clock, Seattle Seahawks wide receiver David Moore drops a touchdown pass from Russell Wilson, sealing a win for the Los Angeles Chargers. NFL Fantasy Insider Michael Fabiano lists his top five fantasy sleeprs in Week 9.